Note: This map may take multiple tries to get started. Should it crash when you are trying to load it please try again. It runs crash free once loaded. This is 15 X 15 SAM map of the modern India, starting with independence in 1947 and ending in 2010. I have slowed the action to 60 turns, and adjusted the engine maintenance cost accordingly. where did the huge Australia map goto? Unfortunately the map was broken and couldn’t even start for the three users I got to test it, including myself. Hopefully a working version will come out someday. i dont understand the map maker releases a map that doesn’t work on other user’s PC. That particular map underwent a vigorous testing. It was designed on a Windows XP system. It does not work on some machines – including mine – . It was suggested, that the motherboard’s bios might make a difference, or the brand of the CPU, or the make and design of the RAM. There is no reason to think that it might be a case of incompatible hardware. The map simply has a bug somewhere. My guess is that something didn’t get packaged that should have. Nice map, it took all my cunning (or lack thereof :P) to finish the first part. I had only months to spare but the last moneytrain arrived on time at Delhi. Now on to the second part, the touristroute is waiting! Aaaand I failed… Too bad, but I just came short, or I started too late with the second half… This one is going to my favourites! 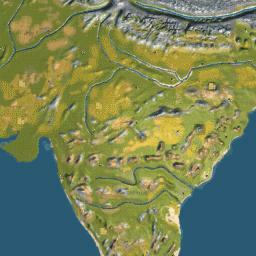 Hey guys there’s an easier way to play any map that u have downloaded just extract the files to C:\Program Files\Sid Meier’s Railroads\Assets\SharedMaps or Usermaps. i really liked the india map..but unfortunately it crashes for me..in the end..any reasons..my computer has latest specs. Jancsika has produced many excellent maps and this is another one. I really enjoyed all the track laying and unusual goods (eg. liver transplant patient, students, geeks, etc.) I had one crash when I first starting shipping students, but I recovered using the latest auto-save file and finished the game without another crash. Sometimes my computer crashes if I try to lay track too fast when the game is already busy running trains or managing auctions. This is a problem for me with all maps not just this one. I ended up with 10,000 miles of track in the India map in order to move all required goods. The game slows considerably when laying track late in the game, so be patient (but not a liver transplant patient). Nice work by Jancsika! !